Is Android really safe? This question often comes to your mind and you always worry about your Android Phone Security. Sometimes we see unnecessary push notifications in the notification bar, some of which also seem spam. When we browse a website using a browser on Android, suddenly we see a warning: “Your phone is slow click on the fix to resolve your phone performance” and your phone starts vibration. So we think our phone has been infected with malware, but that is not true. To better understand about Android Phone security we will understand how to secure our Android Phone? from evils such as Malware, Hackers, and thieves. Is your Android phone Safe? How to Secure Android Phone? When we purchase a brand new Android Smartphone, it comes with some selected preinstalled apps and games then it is secured. But how long? Until we don’t install any new app. But you also do not understand that the new phone you have taken is also completely safe. If a bug is present in the Android OS and developers of didn’t know about it, then the vulnerability can cause safety and the malware and hacker can easily get access your phone data. So to avoid such troubles, always buy mobile phone of a reputed company, Once a bug is detected, the company release a bug fix soon. The top Smartphone selling company accused two times for collection of users data. First, a security researcher Chrish posted on his blog Chirsdcmoore and asked about the why is the OnePlus collecting users data information such as “IMEI number, phone numbers, MAC addresses, mobile network names, IMSI, and wireless network identifying numbers”. and sending information to open.oneplus.com server. 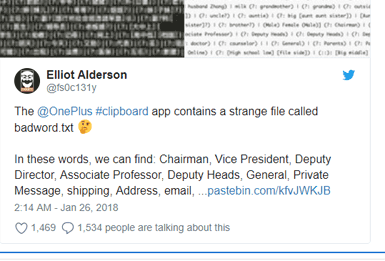 Another big issue found by a Security researcher “Elliot Alderson” he posted on the Twitter timeline about how OnePlus is collecting users data from Smartphones with an inbuilt app #clipboard. It was shocking to everyone because why a smartphone company is collection users data without the permission, but after the problem has surfaced, they fixed this app through the wireless update. It is not necessary that only Smartphone developers collect your data. Once again Elliot Alderson revealed the security flaw in a Government official app Namo App. The Security researcher twitted that the Narendra Modi app is collecting user data and sending it to a non-official third-party website called CleverTap. Hence, We can’t trust anybody in 2019, whether it is a smartphone maker or a government official app. After reading above paras, you will be worried. So If I say every Smartphone company wants to collect your information such your interest, location, Call History, Web Browsing History, etc. Then what you say about this? After reading this, a question must have been coming to your mind that what the benefits will they get from this? Don’t think about that Smartphone manufacturer only making money via selling their smartphone and repairing faulty Phones. Even after selling Smartphone, the company can earn a lot of money by collecting your activity data and then selling it to another company. Not only smartphone companies, you install many apps on your phone that also track your activities. Like Facebook, Twitter. So you’re not safe because your privacy and information are leaking everywhere. It is also not compulsory that all of these are always collecting your data without your permission. Even people, without thinking, agree to their Terms & Conditions. Where they explicitly mentioned that “We will collect your activity data to improve our services”. So when you install any android app, first read the terms of usage agreement carefully. Always use a Mobile Antivirus and don’t forget the select top Antivirus provider brand. There are lots of free Antiviruses available in the Google Play Store, Who claim to protect your phone but today in the world there is nothing available for free. If they say it is free, then something is hidden facts behind of this. So try to use the premium version as far as possible. Today premium antivirus is also not too much costly, due to the high competition you will get it at a very affordable price. I’ll recommend using Eset Nod32 Mobile Security, Avast Mobile Security Antivirus, Kaspersky Mobile Antivirus Security. Rooting your phone is left some ways for hackers to inject the malware codes into System root files. So you’ll never know that the data of your phone is easily going to thieves over the network. If you have knowledge that how to deal with a rooted phone? How to root the phone safely? Only then go for such process. The Phone rooting is not much necessary nowadays because all the phone is already coming with highest spaces and you’ll not face CPU, RAM, and Storage related problem. By default, the Background Data option is enabled on your Android Phone. If it is enabled, then all the apps continue to use the Internet data in the Background, even when you didn’t open. But you can restrict the background data. So any app will not get internet access until you will not open it or you’ll not Enable the Background data again. This method will prevent the app from sending unnecessary data to hackers. If you backup your Android phone data such as Apps, Settings, Contacts, Call History etc, when your phone hacked by someone, then the data can be restored after factory reset or flashing Rom. It will also be useful because you can restore this data to the new phone. This option is disabled by default and not necessary to enable until you don’t want to install apps from other location. Means If you’re going to install an app from third-party app stores or SD Card Storage. Will recommend keeping Disable Unknown Sources option. Even on Google Play Store is not every app safe but you’ll remain safe because Google always do a safety check of the installed app and when it detects something suspicious behavior in the app then it remove from Google Play Store as well as recommends to delete from the phone. So don’t go for third party source because if you installed any malicious app by mistake, then nobody will be able to help you. It is another fact because we install any app from Google Play without checking its rating. If we install a buggy app, then it can prove to be messy with the security of our phone anytime. 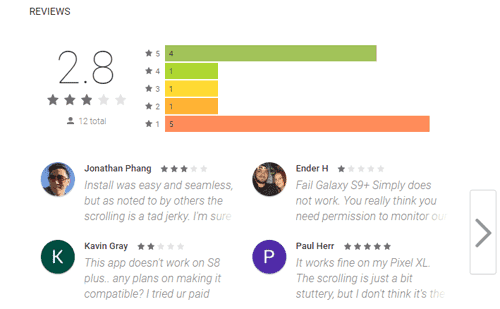 So never trust & install those apps that have low ratings. For this check the “Reviews” section of the app in the Google Play Store. When we install any app on our smartphone, then we never check which permission the app is asking to allow. While installing, we only tap Allow button and don’t think the app is asking for additional permission of your app which may not be required to run. For example, you have installed a Video playing app then the necessary permission for the app is only “Storage”. If it also asks you to allow Camera, Location, Phone, Microphone, SMS, Contacts, etc. Then you’ll need to give some attention on this. So allow only those permitted to the app that is must require running the app and other do disable. If you’re allowing every single permission to the app then it can quickly get access to permitted hardware without your permission. Eg: It can record your voice anytime or can capture your pic. So be safe while permitting any app. Check this: Manage App Permissions on Android Oreo 8.0. Recently, it also came to know that the most popular social media giant Facebook also collects user data from its website and through the Official app. Which sold the 57bn users data to the third-party firm “Cambridge Analytica”. The data analytics firm had worked with Donald Trump’s election team. So be careful also when you allow all permission to a favorite app. If you use pirated content on your Phone then 100% chances are one day your phone will be hacked. When you download Pirated content such as premium Apps, Movies, Videos, many sites will try to install malware on your phone. This thing you would have noticed when you visit such site then sometime a pop message starts appearing on the screen and says “Your Android is infected”. And your phone starts vibrating. If you click on the “Remove Virus Now” or similar button, then a malware consist app will begin downloading and try to install. If you don’t care then after downloading your phone will be hacked. Time to time Smartphone companies release the software update for their companies phones, these software updates contain the security patches and bug fixes. If you don’t update software then it will be high risk because you’re messing with the security of your phone. Big phone developing companies such as Samsung, iPhone, and Google release a high number of security patches for their smartphones until the phone becomes completely secure. You can check for software updates by going Phone Settings » Scroll down last option (different on different device) it may be the System or About Phone option. Now find the System or Software update option and check for is there any security patch has been released or not, if any software update available then immediately update it. You can enable Password Protection on your device, so no one except you will be open the device and will be not able to harm your device without your permission. A Mobile Tracker can help in a situation when you have lost your phone or someone stole it. If the Mobile tracking system is enabled on your Phone, then it can be easily tracked, find, lock via another device. Track lost Phone with 360 Security Find My Phone feature. 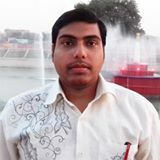 Track, lock and erase data (Android phone) using Google Account.